As many folks know, learning a language is definitely one of the most difficult challenges you can take on, especially if that language is Japanese! Just as we’re all different people with different preferences, our study techniques shouldn’t be the same. What works for one person isn’t necessarily going to work for someone else. The important thing is finding study techniques that actually keep you motivated to learn. Just because someone on the internet claims that they can learn 2000 kanji in a year just by reading flashcards doesn’t mean that another person will be able to achieve anything even close to that number—you might be someone who needs a lot of repetitive writing practice to help those characters sink in, for example. Disclaimer aside, I’ve had a few people ask me what my own study techniques are for learning Japanese. Keep in mind that the techniques I talk about in this post also aren’t set in stone—I often pick up new materials or books and throw them into the mix, or try a slightly different path if I’m feeling stuck. This is what I’m currently focusing on for the N3 exam, but if you’re just getting started with N5 or N4, be sure to have a look at my other article about my experience with those exams, too! I have two daily “logs"—a to-do document in the Evernote app on my computer, and my physical Hobonichi Techo diary that sits on my desk. Each day, I look at my Evernote app where I’ve built a list of “Daily Tasks” that, in a perfect world, I can totally check off each day. Of course, the world isn’t perfect and I may only check off a couple of these, but it helps keep me accountable. I list Anki review, kanji study, vocabulary study, grammar practice, listening practice, shadowing, iTalki lessons (be sure to use my referral link if you'd like to find a teacher of your own and get free credit to start! ), reading and writing practice as blank check boxes. I certainly don’t come close to checking every single box every day, but the following day I can see which I missed and study those first to make sure all areas get equal attention. A screenshot from my Evernote to-do list. My Hobonichi Techo is a Japanese diary and planner that I absolutely love. Similar to a bullet journal, you can use them for anything you like, but I keep mine strictly for listing daily work accomplishments and new words and phrases I pick up each that that might not fit into my main notebook. If I’m having a particularly difficult time remembering certain words, I’ll write them here for review later. My version is the Japanese one, so the daily quotes are also fun to (attempt to) translate. It can be completely overwhelming to have too much stuff to focus on—"which Memrise course is best? How far should I go in WaniKani? Is this Intermediate Guide to Japanese going to teach me everything I need to know for my exam? "—were questions I definitely found myself thinking—which is why I decided that complete set of exam-specific books might be the best way to keep me from being distracted over the next six months. After asking friends’ opinions, reading reviews, and my gut feeling, I decided on the Shin Kanzen Master (新完全マスター) series of books to tackle the N3 exam. It was a toss up between those and the Nihongo Sou Matome series, but in the end I read that the Shin Kanzen Master books were a little bit harder, more focused on efficient exam strategies in particular, and let me be honest—as a designer, I think the cover designs are beautiful! Unfortunately, the Kanzen Master series is only available for higher exam levels, but if you’d like to read more in-depth about how I passed the N5 and N4 exams, check out my other blog post which is also full of resources specific to those levels that really helped me a lot. I believe one of the most important things about learning Japanese is to not pour too much study into a single app, book, or resource for an extended period of time. I’m guilty of this with WaniKani. It’s a wonderful app for sure, but it can also be too good—before studying for my N5 exam, I became so obsessed with learning kanji with it that I went well beyond what was required for me for the N5 level and ended up wasting a lot of time that I should have been spending on my weak points—grammar and listening. Recently, I’ve kicked my N3 study plan up a notch and every day I try to study a little bit of everything, even if it’s just for a few minutes—kanji, vocabulary, grammar, listening, and speaking. I’ll hop from my grammar book to my kanji book after half an hour or so, and later on I’ll usually write texts to my Japanese friends. Every night I try to end the day with a bit of light manga reading—something easy enough for me to read without much use of a dictionary so it doesn’t feel like study, but useful practice all the same. To prevent my brain from getting stuck in “cruise control” and becoming overly comfortable with a study topic, I decided to take a different approach this time. I was never a huge fan of the Anki app, preferring pre-made Memrise courses, but after speaking to a friend about it, I went ahead and put my WaniKani on vacation mode, grabbed my Kanzen Master books, and started designing a “N3 Super Study Deck” to contain absolutely everything that I want to memorize. Everything is dumped into the same deck—vocabulary, kanji, grammar, and sample sentences. That way, I never know what’s coming next—instead of feeling comfortable in a review knowing that I’m only testing myself on kanji recollection—a grammar point will pop up and get my brain working a little harder. I’m already finding my memory retention to be much, much better because of it. 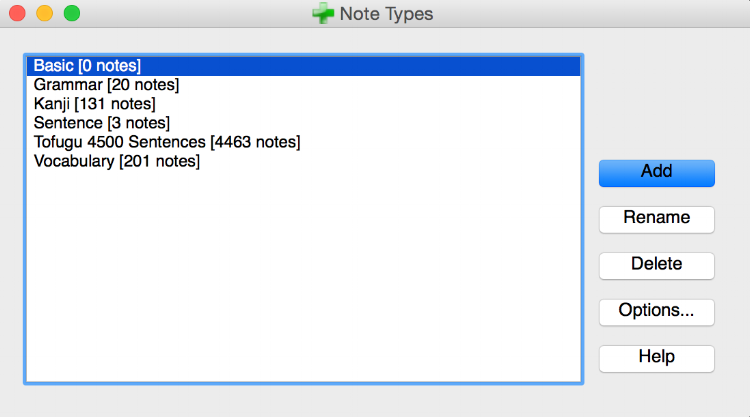 Then, I decided which fields to add for each type of note. For example, for Kanji cards I added input fields for Meaning, Kunyomi Reading, Kunyomi sample words, Onyomi Reading, and Onyomi sample words. When adding something new to my deck, I make sure to tag it appropriately. I tag vocabulary as noun, i-adjective, na-adjective, transitive or intransitive verb, ichidan verb, and so on—meaning if I’m feeling particularly rusty on my transitive and transitive verb pairs, I can custom study a deck of those only. My kanji are tagged as kanji as well, so I can do the same if I want to focus on that only before the big exam. Anki is certainly a little tricky to get the hang of setting up, but so far I’m loving having everything in one huge database. My focus is much more precise and I don’t have to worry about jumping around from app to app and wasting more time. Of course, my study doesn’t end with Anki. I’ve heard that consuming media is one of the most important things to boost your skills in preparing for the N3 exam, so I’m trying to do just that. Every day I try to do a few extra things: listening practice, writing practice, and reading practice. I’ll check these off my list even if it’s something as simple as chatting with Japanese friends on LINE or commenting in Japanese on Instagram. It’s easy to forget that these things absolutely count as study even if it doesn’t feel like it! For listening, I try to watch Japanese Netflix shows with Japanese subtitles on instead of English (of course, this isn’t helpful if you’re a total beginner) or NHK World Documentaries. And, perhaps most importantly, I’m trying to read as much level-appropriate native material as possible. Over the past few months I’ve made a habit to read for at least 15 minutes in bed each night—if I feel tired out I’ll read something easy like よつばと!, and if I’m feeling like I have some energy left, I’ll pick up a more difficult manga or even my Doraemon grammar manga I’m working my way through. Above all, keep going! Like many have said before, it’s better to study every day for a little bit instead of cramming a few hours in once a week. Hopefully my own study techniques will help you plan your own study schedule, and fingers crossed it’ll work for me when the N3 rolls around in July!